The LAN backup is a backup performed on one computer and is stored on another remote computer or network-attached device connected to the same network. No data leave the local area by this form of backup, but the storage media is often physically placed in a different areas with the source computer. To perform LAN backup, you must determine where to store your data. You may choose between the remote server, the NAS storage, the network drive, the dedicated FTP or secured SFTP/FTPS containment, and so more. And next, you may use the dedicated software for network backup, like Handy Backup Server Network edition, to schedule and perform tasks of copying or restoring your chosen data through your LAN. Read more about LAN backup software and about remote backup. 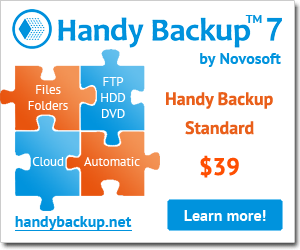 Download Handy Backup to perform LAN backup. Network attached storage - get the bonus from fast cross-platform storages!